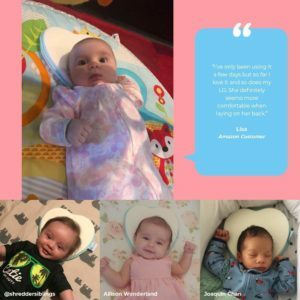 Newborn Baby Pillow, Memory Foam Cushion for Flat Head Syndrome Prevention and Head Support is now available at Amazon.com for just $19.99 (REG $39.99) (As of 04 February 2019, 16:41 PST – Details) with $20.00 (50%) Savings. 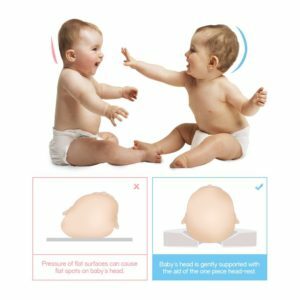 HELPS YOUR BABY SLEEP IN PROPER POSITION – The newborn head pillow is designed to allow better airflow on the neck which leads to better quality of sleep. 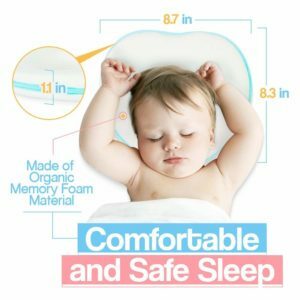 The pillow is very soft, thus providing the amazing comfort your baby needs while still supplying the necessary support to keep your infant’s head in alignment to the spine. 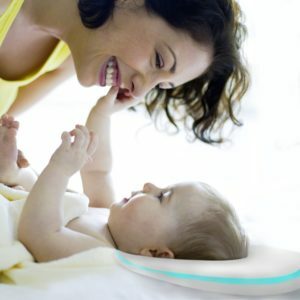 ASSISTS IN HEALTHY INFANT DEVELOPMENT – With consent and advice from your pediatrician, using this baby pillow can help prevent flat head syndrome for babies aged 0-6 months. Flat head syndrome pertains to flat spots on the back of the skull from sleeping on hard mattresses, or from sleeping on the baby’s back. DESIGNED WITH BABY’S COMFORT IN MIND – The baby pillow is made of hypoallergenic and bacteria-resistant memory foam that’s covered with 100% soft, organic, and breathable cotton. Made with premium materials, it helps your baby achieve a more revitalizing sleep. PERFECT FOR ON-THE-GO PARENTS – Measuring 8.7 × 8.3 x 1.18 inches, it’s very convenient for on-the-go parents as it can be used as an insert for bassinets, infant car seats, swings, bouncer, strollers, cradles, and more. Ashtonbee’s baby pillow is very travel-friendly! COVERED BY OUR INDUSTRY LEADING 100% LIFETIME WARRANTY – When you order from us, you’re in good hands with our no-risk, no-questions asked Money Back Guarantee and Top-Rated customer service. Ashtonbee is a brand that’s committed to your success! The newborn head pillow is soft and supple. 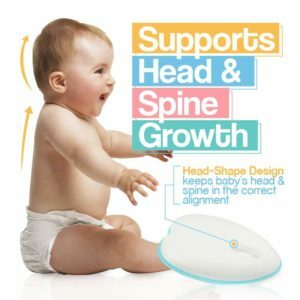 It provides a great deal of comfort while still giving the essential support to keep your infant’s head in proper alignment. 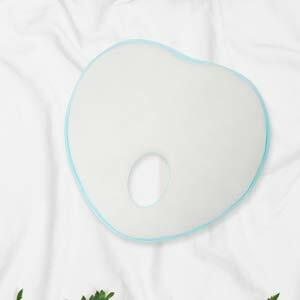 This pillow gives your baby the gentle and supportive positioning that he or she needs for better quality sleep. 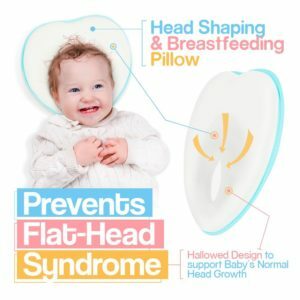 Given the recommendation and advice of your pediatrician, using Ashtonbee’s baby pillow can encourage natural round growth of your baby’s head and can help prevent flat head syndrome. Be sure to check with your doctor for proper medication or medical advice. 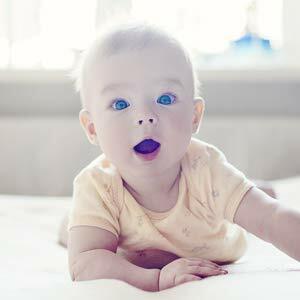 The baby pillow is made of premium memory foam cushion that’s bacteria-resistant and hypoallergenic. It’s also wrapped in 100% organic and breathable cotton material that’s soft and gentle enough for baby’s sensitive skin. The pillow is very convenient for on-the-go parents as it can be used as an insert for bassinets, infant car seats, swings, bouncer, strollers, cradles, and more. 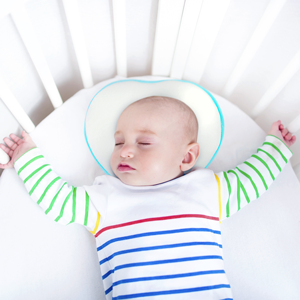 With your utmost supervision, this helps your baby achieve a comfortable sleep even when you’re out and about. 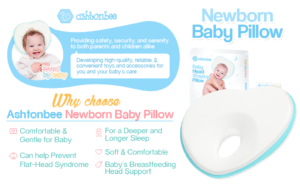 Ashtonbee’s baby pillow is very travel-friendly! 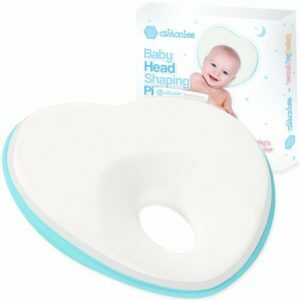 Ashtonbee’s baby head pillow is a thoughtful gift for parents, and parents-to-be, whether it be for baby showers, gender reveal parties, birthdays, holidays, and more. If you’re looking for a functional and premium present, then this pillow is one for the books!